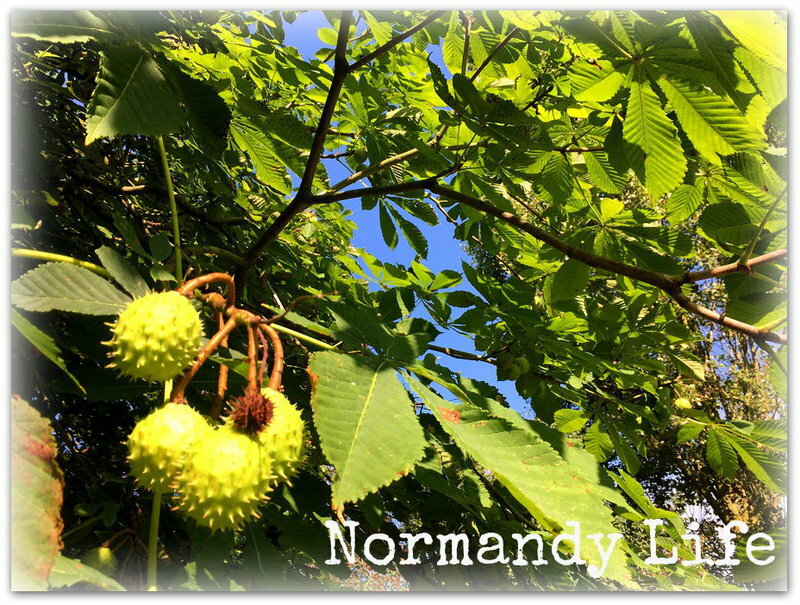 Normandy Life: Mosaic Monday # 12. 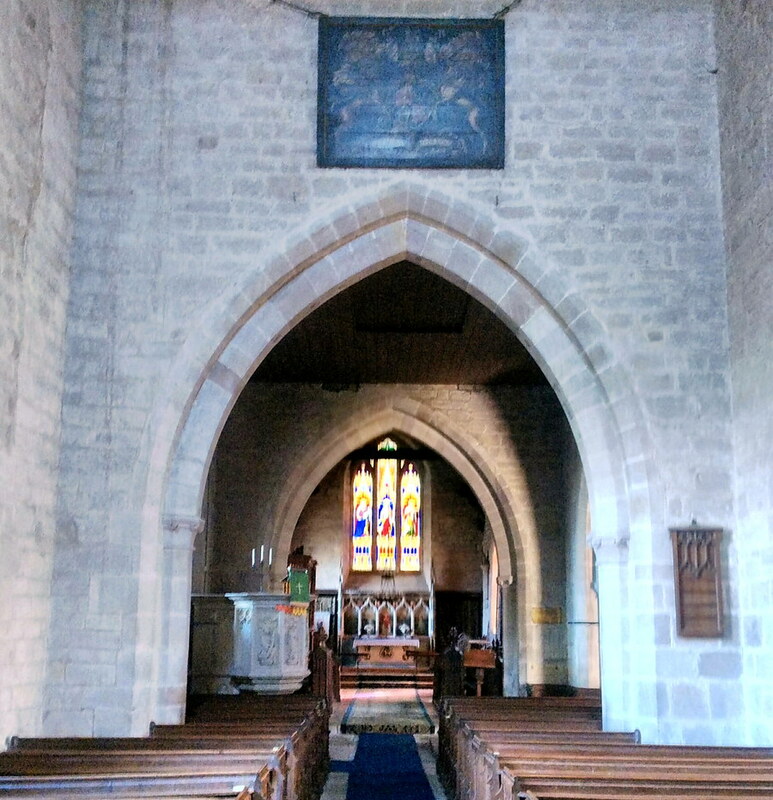 The Church at Stanton Lacy, Shropshire. Mosaic Monday # 12. 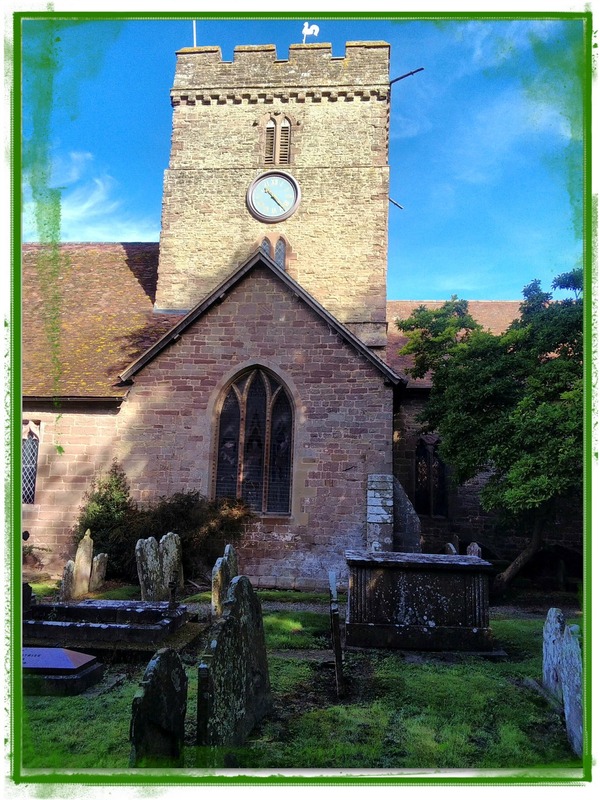 The Church at Stanton Lacy, Shropshire. 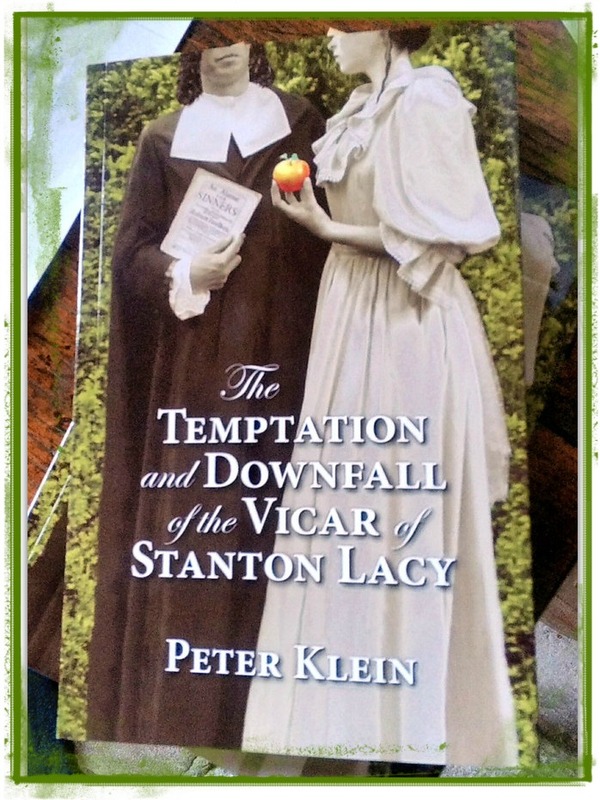 Whilst browsing the shelves of the Castle Bookshop in Ludlow last month I spied a book with a very intriguing title, "The Temptation and Downfall of the Vicar of Stanton Lacy". I put the book down to wander further down the aisles, got distracted by something else and forgot to pick it up again. At breakfast the next morning our B&B host regaled us with the story of the aforementioned Vicar and his misdeeds before pointing us in the direction of St Peter's Church, Stanton Lacy just a few miles away. The Vicar in question was one Robert Foulkes (born 1633, died 1678). Robert Foulkes married Isabella Colbach in 1657 at Ludlow Parish Church, Herefordshire . He became the rector of Saint Peters, Stanton Lacy, Shropshire four years later. Together they had four children born between 1665 and 1673. 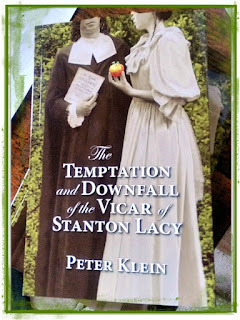 Isabella had grown up in Stanton Lacy in the home of the previous vicar, Thomas Atkinson, who had a daughter, Ann. Foulkes began to neglect his wife and family as well as his parochial duties. He started an affair with Ann Atkinson in 1669 and was regularly seen indulging in local alehouses. In 1674 Ann was sent away from Stanton Lacy and bore an illegitimate baby girl which was believed to have been fathered by Foulkes. In 1676 he was called before the ecclesiastical court in Ludlow to answer charges of beating his wife and his churchwarden after returning home drunk from a bowling match. Two years later he seduced a young woman who resided with him, she became pregnant and he moved her to a lodging in the Strand, London. Foulkes murdered the child at birth by stabbing it in the throat and disposing of it in the River Thames. When the baby's body was found he made a full confession and was tried and convicted at the Old Bailey in January 1678. Whilst awaiting execution at Tyburn, London he penned the missive "An Alarme For Sinners" which contained his confession, prayers, letters and last words. He was executed on the morning of 31st January and buried at night at St Giles-in-the-Field, London. Today the churchyard of St Peters is quiet and peaceful, with no hint of the events that took place there almost 350 years ago. 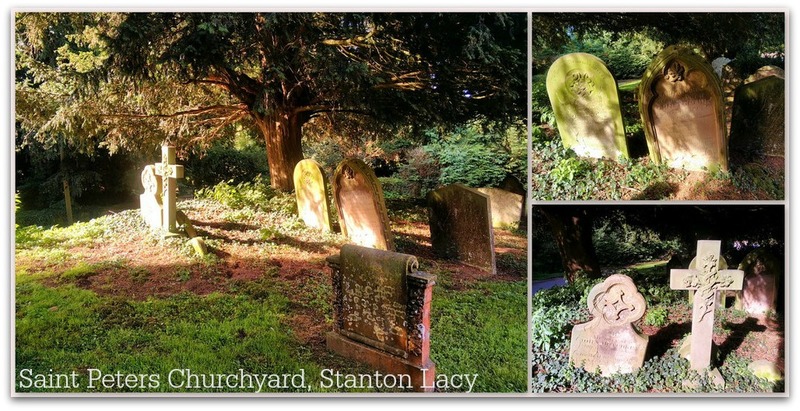 However the history of the site, on which the Church of Stanton Lacy stands, dates back to AD 630 as the Legend of Saint Milburga on the Church website explains. "The earliest stonework of the present building, namely the west and north walls of the nave and the north transept have been dated to the first half of the 11th century, but visiting archeologists have suggested that the church is at the centre of a much earlier, roughly circular churchyard. It is possible that there was an earlier, wooden structure, one which legend attributes to St Milburga. So the story goes, she was being pursued by a Welsh prince, when she crossed the river Corve close to the present church, and prayed for deliverance. And deliverance is what she got, because the river level rose very quickly and flooded the adjacent land, blocking the path of her pursuer. By way of thanks, she is supposed to have founded a church here. As St Milburga is associated with the founding of Wenlock Priory, dated to AD 630, that would extend the history of Stanton Lacy church by a further 300 years. The rapid flooding of the river is by no means rare, which lends some credibility to the story." In January and February the grounds are covered with masses of snowdrops, with refreshments being offered to visitors on the second weekend of February. Inside the church the silence is golden. 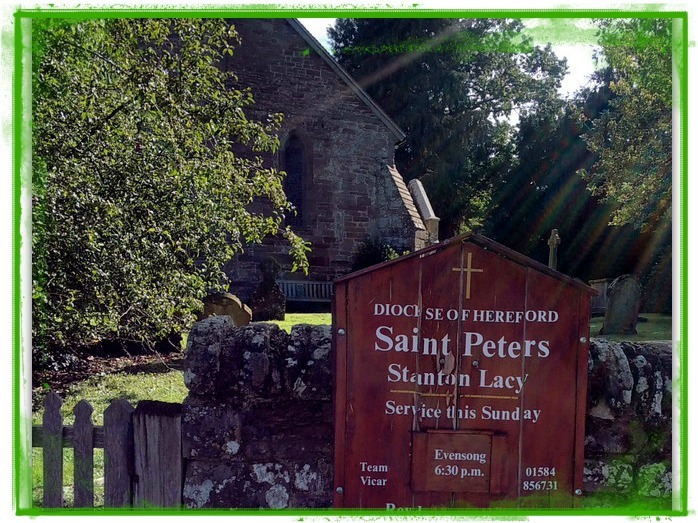 Services are still held at Saint Peters with Sunday evensong at 6.30 pm. Hand embroidered kneelers decorate the pews. 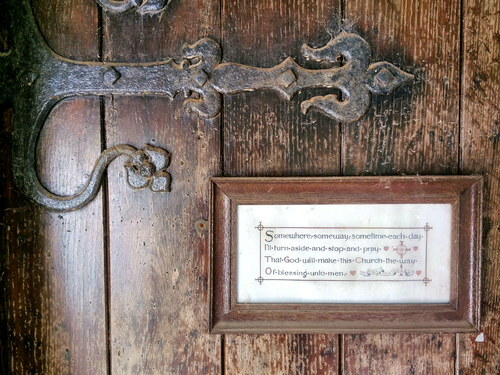 As we left the church I paused to read this sign on the oak plank door. Quiet & beautiful place, hiding detective story like faiths... Have a good week Maggie. Such a dramatic story and history for Robert Foulkes, Maggie! It seems the foibles of man are the same throughout the ages. I enjoyed looking at your photos of the church and cemetery. My goodness what a wild and weird history that beautiful calm looking place does hide! Very interesting - and sometimes very sad - story of a beautiful place. Hope your week ahead is wonderful. That is quite the story, and I'm sure the book would be a good read. It looks like a lovely place to visit. Linda, tried to leave a comment on your Beatrix Potter post but the gremlins stopped me! Hope you find the picnic set for your grandchildren soon. Fascinating, Maggie. I loved reading the history. The kneelers are lovely. 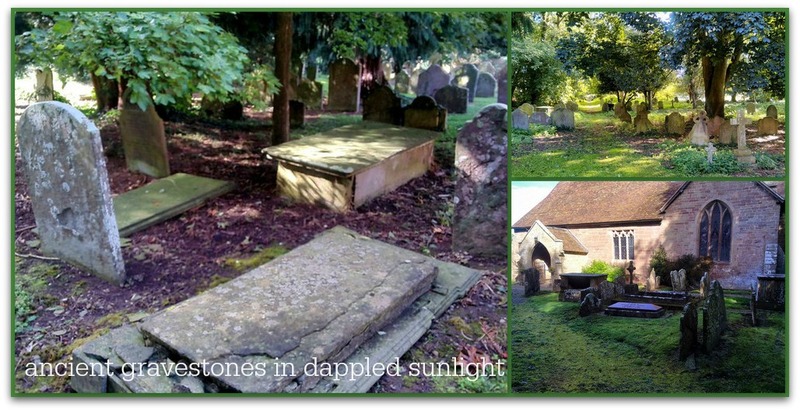 I love looking into the history of these old places - fascinating. Have a fabulous week and thankyou for the link up. I enjoyed your visit to The Church at Stanton Lacy. What a story! And even more history. Have a great week and thank you for hosting! Impressive and fascinating history of this site; the churchyard it looks peaceful; so lovely aspects of architecture style, too! Many thanks for sharing them with us and for hosting, as well! Have a very good and sunny day and good start in the new week! Oh my, what a tragic story. Truth is stranger than fiction. Beautiful photos to go along with the story. Love those kneelers. Such beautiful work. The door that the sign is on is very cool. I like the prayer, too. I'm away from home right now and will not be participating today but will be back next week. Have a wonderful week! The stories that surround such places can be amazing. What a sad tale. And so interesting how the church came to be. Thanks for sharing your tour with us and for hosting MM. of people who have gone before us. Thank you for hosting MM. Have a great week.